2016 marks the 35th year of operations for Superior Walls. The innovator of precast concrete foundation systems has installed more than 125,000 foundations since 1981 across the U.S. and Canada. Superior Walls marks 35 years of manufacturing precast concrete foundations in 2016. Superior Walls, innovator of the precast concrete foundation system, celebrates 35 years of operation in 2016. The company manufactures the only foundation to have earned the NGBS Green Certified Product designation and has precast concrete system licensee manufacturing operations throughout the United States and Canada. During the past 35 years, Superior Walls has installed more than 125,000 foundation systems. The large number doesn't surprise founder Mel Zimmerman, who was a builder in Lancaster County, Pa. when he developed the solution to damp, weak basement foundations. "A real estate agent asked me to look at a bowed block wall foundation that needed to be fixed," says Zimmerman, who is retired and lives in Denver, Pa. "I figured out a way to anchor that wall and reinforce it. That got me to thinking that concrete was the solution to these unstable foundation situations." After discarding spray concrete as an alternative, Zimmerman decided to start precasting concrete panels. One of the big advantages at the time --- and today --- is that each panel is customized for a project and strategically designed with holes for wiring to pass through. "We developed a strong, dry basement that made it like framing a house with reliable concrete studs," says Zimmerman. "As the company grew, we continued to invest in research and development so we could find better, faster and greener ways for the precast concrete wall panels to be installed." Starting in 1986, Zimmerman welcomed the first licensee for Superior Walls, Weaver Precast out of Ephrata, Pa. Thirty years later, 10 additional licensees operations have been added in New York, Virginia, Tennessee, Michigan, North Carolina, New Jersey and Pennsylvania. Today 25 states are serviced by licensees of Superior Walls. A new milestone was achieved by the company in 2014, when two licensee operations were opened in Canada. Superior Walls Alberta, LTD, located near Calgary, offers Superior Walls® Xi™ products throughout the province of Alberta. Superior Walls by Magnis, Inc., out of Beausejour, provides Superior Walls® Xi Plus™ products throughout the Manitoba province. "We believe Canada represents exceptional opportunity for our precast concrete products and expect to expand further into Canada in the near future," says Keith Weller, vice president and CFO of Superior Walls of America. "Our energy-efficient products meet the demanding energy codes in Canada and perfectly complement the shorter building season in that country due to weather conditions." Known for their durability, speed of installation (usually in a single day) and damp-free basement conditions, the selection of Superior Walls products has expanded in the past 35 years. The original R5® precast wall developed by Zimmerman was joined in 2003 by the Xi wall, followed by the Xi Plus wall in 2012. In 2011 an uninsulated four-foot high precast concrete foundation (the Ui Wall™) was introduced for use primarily under garages and porch systems. The AG Wall™, also launched in 2011, is specifically designed and modified for use above grade. The precast walls can be used in conjunction with foundation panels and stacked to create multiple stories as a part of a complete wall system building solution. All Superior Walls products are pre-engineered and custom manufactured off site in indoor production facilities, eliminating any on-site soil contamination such as the form oil used for poured walls. No on-site sprays or bituminous coatings are required to make the walls dampproof. The panels are delivered directly to a jobsite where certified crews install the precast wall panels. Since Superior Walls panels are engineered and manufactured with insulated concrete studs, Superior Walls reduces the amount of materials used to build a structure, including wood and concrete, and reduces the carbon footprint of a new home or commercial facility's construction process. Superior Walls products have passed many tests over the years and earned the respect of builders throughout North America. In 2009 Superior Walls insulated precast concrete wall systems earned the NGBS Green Certified Product designation by the Home Innovation Research Labs. Now, six years later, Superior Walls is still the only energy-efficient foundation system approved by the independent labs. Practice 601.2.2 – 3 points – Higher Grade or higher strength of the same materials than commonly specified are used and component sizes are reduced. Practice 601.5 (1-3) – 4 points – Precut/preassembled components, panelized, or precast assemblies are utilized for a minimum of 90% of floor, wall, and/or roof system. Practice 602.1.1.2 - 3 points - A capillary break is provided between the footing and the foundation wall. Practice 608.1 – 3 points – Products containing fewer materials are used to achieve the same end-use requirements as conventional products. Xi and Xi Plus foundation wall panels provide R values that meet or exceed energy conservation values for both the International Energy Conservation Code (IECC) and the International Residential Code (IRC). In 2012 the Canadian Construction Materials Centre (CCMC) declared that Superior Walls precast concrete insulated wall panels were evaluated for use in Canada. This opened the door for new licensee opportunities throughout the Canadian provinces. Superior Walls prefabricated foundation walls are resource efficient, using up to 70 percent less concrete in a new home than conventional foundations. Stud facings eliminate the need for additional wood framing prior to interior finishing. Using fewer materials helps reduce the carbon footprint of the new home’s construction process. Available for installation year-round, the foundation panels provide warm, dry basements for homeowners - even in the harshest and coldest northern climates. 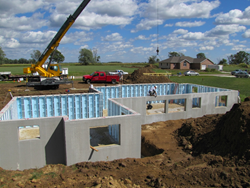 For homeowners, the benefits of Superior Walls foundations systems are substantial. The energy-efficient walls help lower energy costs and reduce energy leakage while providing increased living space in a comfortable setting. The precast concrete systems help improve the indoor air quality in a dry basement setting along with enhancing the resale value of a home.